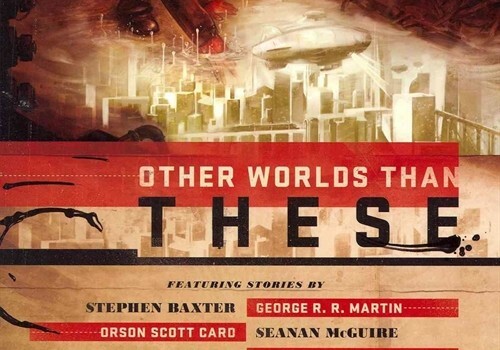 Other Worlds Than These is a collection of short stories with one message; that we are not alone. And not because outer space is populated by little green men, but because there is a strong, actual probability that our universe is not the only one in existence. Though none of us are quantum physicists, we can all appreciate the theory that an infinite number of worlds exist parallel to ours, that an infinite number of possibilities are being played out as we speak, that if we could only touch these other existences we could exist in a way we have never existed before. Pretty heavy stuff, and here is a collection of works by many famous authors that all touch on this fascinating sci-fi subject. Enjoy. This gathering of stories features some of the best science-fiction writers of our time bending their minds toward a subject that’s almost too large to fathom, the idea that everything is possible. The collection references great works of fiction that examine other worlds, from The Wizard of Oz and The Dark Tower to The Golden Compass and The Chronicles of Narnia, tales of wild imagination that may not be as scientifically improbable as we might readily imagine. Some names that will appear with stories in this book are almost as impressive as these titles: Stephen Baxter, Joyce Carol Oates, Ursula K. Le Guin, Stephen King, George R.R. Martin, Orson Scott Card. These big names lend their genius to a mind-boggling adventure into alternate dimensions, some of which we might not return from unscathed. Though not every story will end up being a complete home run, the book as a whole is. We visit so many different lands, different realities, different places, all with a lesson to teach us about our own tiny world. This isn’t sci-fi in the way you imagine it, it’s a peek at how stepping across the boundary between the right-now and the might-be can show us immeasurably important truths about our existence. One different decision and your life changes, one person missing and your happiness disappears, one experiment gone too far and Earth is altered forever. This is a collection meant to challenge your scope of thinking, to expand your horizons past the here to the maybe, to show you that science might be more than just fiction.